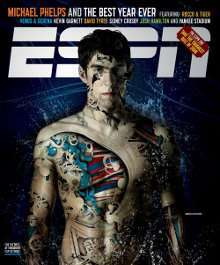 ESPN The Magazine is a biweekly sports magazine published by the ESPN sports network in Bristol, Connecticut in the United States. The first issue was published on March 11, 1998. The main sports covered include Major League Baseball, National Basketball Association, National Football League, National Hockey League, college basketball, and college football. The magazine typically takes a more light-hearted and humorous approach to sporting news compared to competitors such as Sports Illustrated and previously the Sporting News. ↑ "List of Top 10 Best Sports Magazines of All time". Sporty Ghost. March 3, 2015. Retrieved February 12, 2016. 1 2 Michael McCarthy (September 28, 2009). "First look: In ESPN's magazine, showing skin is no issue". USA Today. Retrieved February 1, 2015.